1 ESGE recommends small-bowel video capsule endoscopy as the first-line investigation in patients with obscure gastrointestinal bleeding (strong recommendation, moderate quality evidence). 2 In patients with overt obscure gastrointestinal bleeding, ESGE recommends performing smallbowel capsule endoscopy as soon as possible after the bleeding episode, optimally within 14 days, in order to maximize the diagnostic yield (strong recommendation, moderate quality evidence). 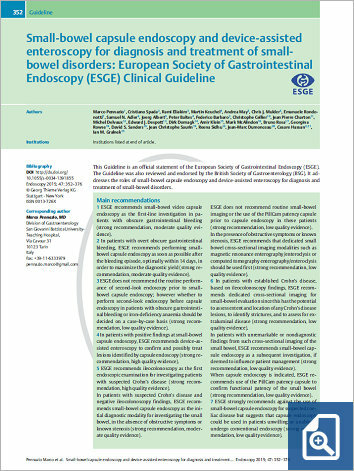 3 ESGE does not recommend the routine performance of second-look endoscopy prior to smallbowel capsule endoscopy; however whether to perform second-look endoscopy before capsule endoscopy in patients with obscure gastrointestinal bleeding or iron-deficiency anaemia should be decided on a case-by-case basis (strong recommendation, lowquality evidence). 4 In patients with positive findings at small-bowel capsule endoscopy, ESGE recommends device-assisted enteroscopy to confirm and possibly treat lesions identified bycapsule endoscopy (strong recommendation, high quality evidence). 5 ESGE recommends ileocolonoscopy as the first endoscopic examination for investigating patients with suspected Crohn’s disease (strong recommendation, high quality evidence). In patients with suspected Crohn’s disease and negative ileocolonoscopy findings, ESGE recommends small-bowel capsule endoscopy as the initial diagnostic modality for investigating the small bowel, in the absence of obstructive symptoms or known stenosis (strong recommendation, moderate quality evidence).ESGE does not recommend routine small-bowel imaging or the use of the PillCam patency capsule prior to capsule endoscopy in these patients (strong recommendation, lowquality evidence). In the presence of obstructivesymptoms or known stenosis, ESGE recommends that dedicated small bowel cross-sectional imaging modalities such as magnetic resonance enterography/enteroclysis or computed tomography enterography/enteroclysis should be used first (strong recommendation, low quality evidence). 6 In patients with established Crohn’s disease, based on ileocolonoscopy findings, ESGE recommends dedicated cross-sectional imaging for small-bowel evaluation since this has the potential to assess extent and location of any Crohn’s disease lesions, to identify strictures, and to assess for extraluminal disease (strong recommendation, low quality evidence). In patients with unremarkable or nondiagnostic findings from such cross-sectional imaging of the small bowel, ESGE recommends small-bowel capsule endoscopy as a subsequent investigation, if deemed to influence patient management (strong recommendation, lowquality evidence). When capsule endoscopy is indicated, ESGE recommends use of the PillCam patency capsule to confirm functional patency of the small bowel (strong recommendation, lowquality evidence). 7 ESGE strongly recommends against the use of small-bowel capsule endoscopy for suspected coeliac disease but suggests that capsule endoscopy could be used in patients unwilling or unable to undergo conventional endoscopy (strong recommendation, lowquality evidence).